Relief Printing is the most basic and direct of all printmaking techniques. Ink is applied to the surface of a printing block and is transferred to paper (think of a rubber stamp). Yet despite this simplicity, subtle and sophisticated results are possible in relief printing. The possibilities are truly endless. In this workshop, Tom will explain strategies and techniques for creating your own relief blocks. 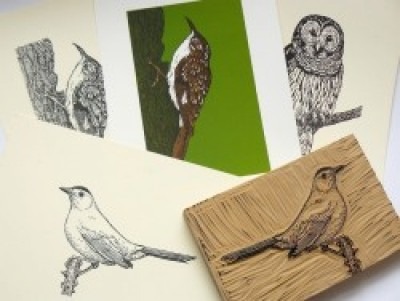 Participants will carve linoleum blocks and print editions on an antique letterpress. Come in with sketches or ideas and see how easy it is to turn them into prints you'll be pleased with! This is a 2 session class, we meet twice: Wednesday, July 13th & July 19th. Pre-payment is required for all workshops at WNYBAC. You can pay online, by phone, or by mail. If you would like to send a check, please email info@wnybookarts.org to let us know. If you would like to pay over the phone, please call 716-348-1430. All workshops will take place at the WNY Book Arts Center and have no prerequisite knowledge required unless otherwise noted. A cancellation fee of $25 will be assessed if cancelled less than 1 week ahead of the workshop. Cancellations with less than 48 hours will not receive a refund. Sold out classes will accept a waiting list. By registering you agree to receive notifications from the WNY Book Arts Center. Classes can cancel due to low enrollment. Please register for workshops at least 2 days prior to ensure the workshop will run!